The Friendship Pet Food Pantry in Lincoln Square is holding its first-ever fundraiser Friday night. LINCOLN SQUARE — Before you wine and dine your sweetheart this weekend, show some love for our four-legged friends at Friday's fundraiser for Lincoln Square's Friendship Pet Food Pantry. The pantry, 2733 W. Lawrence Ave., opened in fall 2013 and served seven families with a total of five dogs and 13 cats during its first monthly distribution. By December 2014, that number had grown to 35 families with 45 dogs and 58 cats. All told in 2014, the pantry fed 330 dogs and 548 cats. “No one should be forced to decide between feeding themselves and feeding their companion animals,” said Dara Salk, co-founder of the pantry and a staff member in the 47th Ward office. 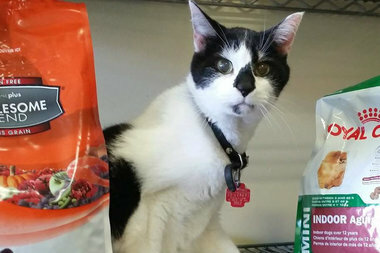 Large donations of pet food from Banfield Charitable Trust and Royal Canin helped launch the pantry, but those supplies have dwindled, according to Salk. The fundraiser will help the pantry replenish its shelves. Tickets to For the Love of Pets are $35 when purchased in advance online, or $40 at the door. The event is scheduled for 7-10 p.m. Friday at Dolce Casa Cafe, 4947 N. Damen Ave.
Small bites will be served, along with wine and beer from Begyle Brewing. Raffle prizes have been donated by a slew of neighborhood businesses including Gather restaurant, Fork, Alapash, Hazel, Neighborly, Pilates Center of Chicago, and more. Can't make the event but want to help? The pantry's website offers a number of ways people can donate money, food or time. The Friendship Pet Food Pantry is open 3-5 p.m. the third Friday of every month. The next distribution date is Feb. 20. Click here for the complete 2015 schedule.